A great alternative to ordering delivery pizza. 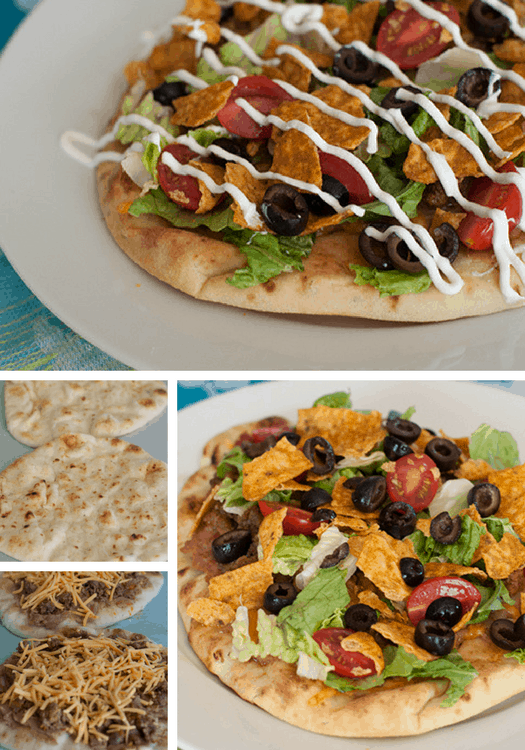 Easily make your own taco pizza with flatbread. Add refried beans, taco meat, and your favorite toppings. Welcome! One of our family’s favorite type of pizza is taco pizza. Our all-time favorite is from Happy Joe’s in Grand Forks, ND. So good! Now that we live so far away, it’s fun to make something very similar at home. Plus ordering pizza for delivery and carry out is getting more and more expensive. 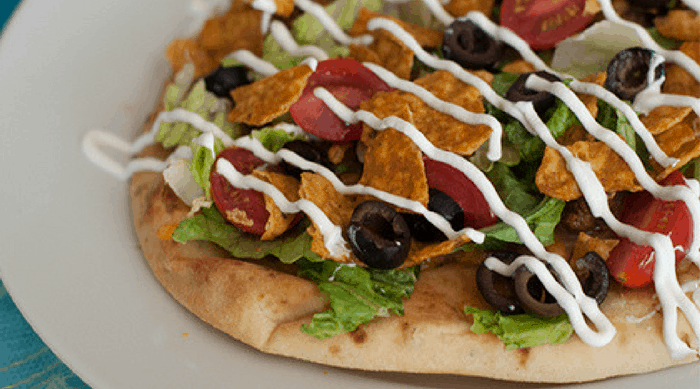 This recipe is a simple yet delicious way to make a taco pizza. The perfect meal for a fun family night in. I baked mine in the oven, but you can also throw it on the grill. Then make the taco meat. Brown the hamburger. Add 1/4 cup or 1 package of taco seasoning plus 3/4 cup of water. Cook for another few minutes until thickened. Set aside. 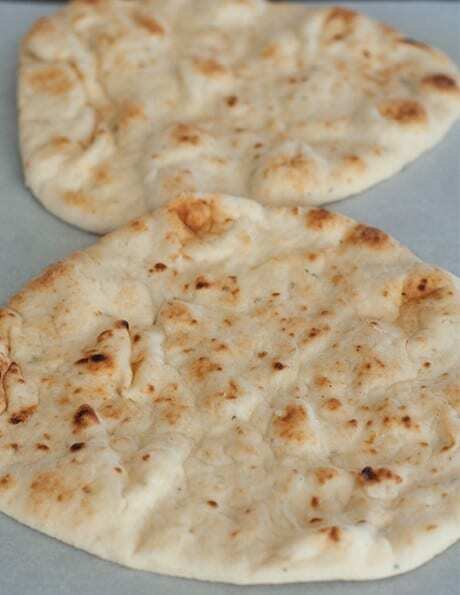 Lay out the Naan bread on parchment paper. I use parchment paper a lot because of the easy cleanup. 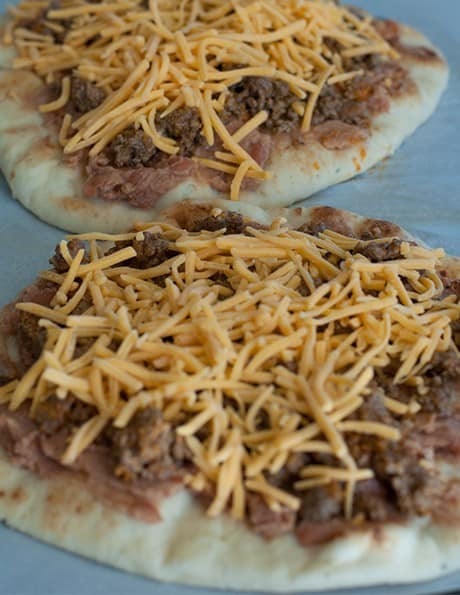 Spread a thin layer of refried beans over each piece of flatbread. Top with taco meat and shredded cheddar cheese. I put the parchment paper with the pizzas directly on the oven rack. Cook for 8 minutes – you just need to warm up the bread, beans and melt the cheese. Remove from the oven. 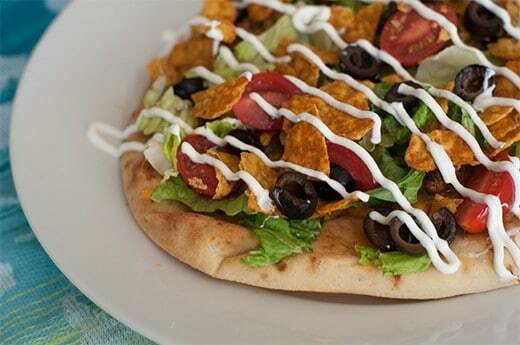 Top with lettuce, sliced cherry tomatoes, sliced olives, and crushed taco chips. Optional – add sour cream and hot sauce. Enjoy! Please stop by and say hi in the comments. 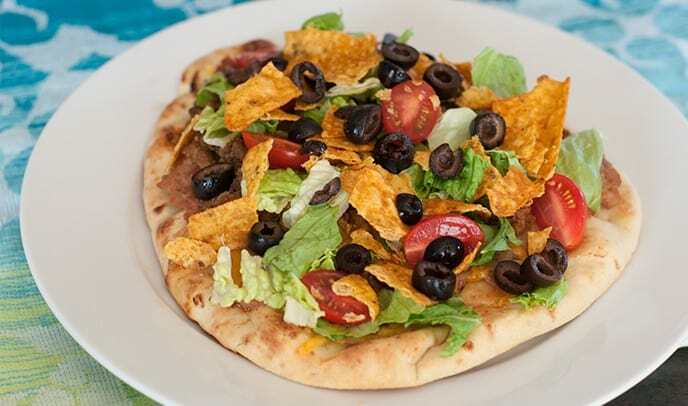 What is your favorite way to make taco pizza? 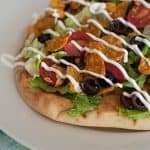 Lazy taco pizza is an easy, healthy taco pizza. No making the crust yourself or ordering in. Flatbread, re-fried beans, taco meat + toppings. I put the parchment paper with the pizzas directly on the oven racks. Cook for 8 minutes – you just need to warm up the bread, beans and melt the cheese. Top with your favorite taco toppings.